2 cups or 1/2 bunch kale de-stemmed and chopped. This recipe requires some knife work. To ensure your safety, always use sharp knives on a clean and clear cutting board. Try using a claw grip to protect your fingers. Now that you are set up, let’s get chopping! Start by cutting up your potatoes, the easiest and fastest way to cut up multiple potatoes is to stack them and slice them together. First, wash the potatoes and use a peeler to peel off the skin. Second, slice the potatoes lengthwise several times into ½ inch slices. 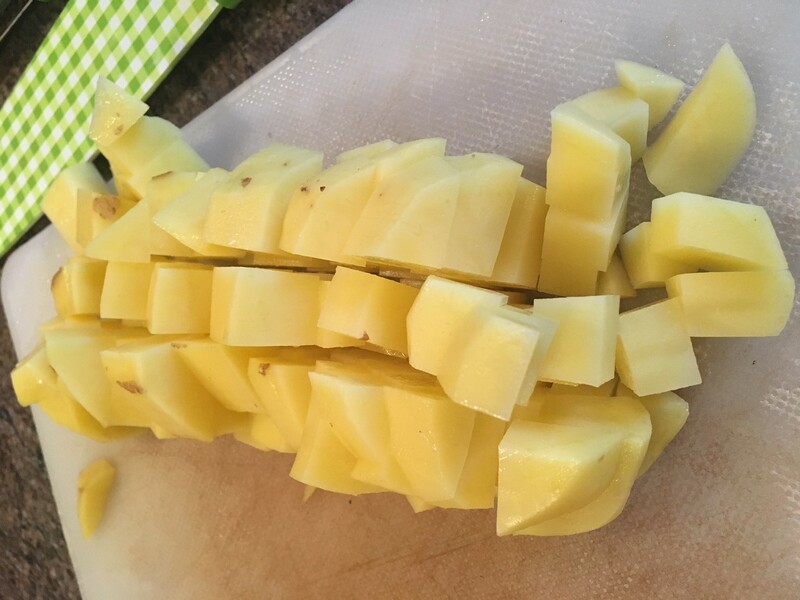 Third, stack the slices on top of each other and cut the slices into ½ inch strips (french-fry style). Fourth, line up the strips and crosscut them into cubes. 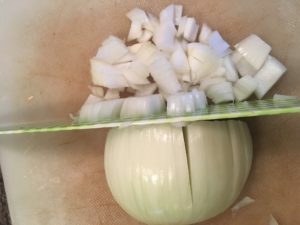 Now, for some easy onion chopping tips. Cut the onion in half, right through the root and stem end. 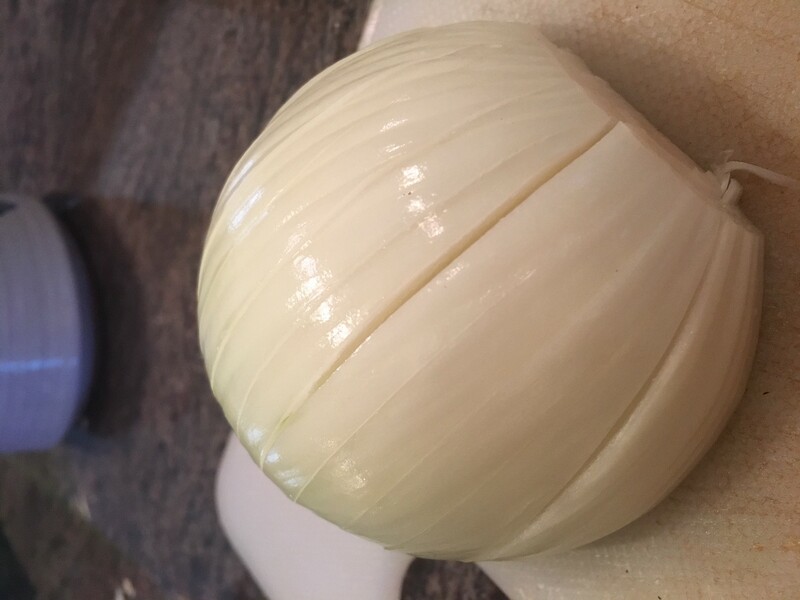 Take on half of your onion and place it flat-side down on a cutting board. Chop off the top stem (non-hairy end) by about a ½ inch. Peel off the papery layers, remove and discard the skin. Holding the root end (hairy end), carefully make lengthwise slices without cutting through the root. 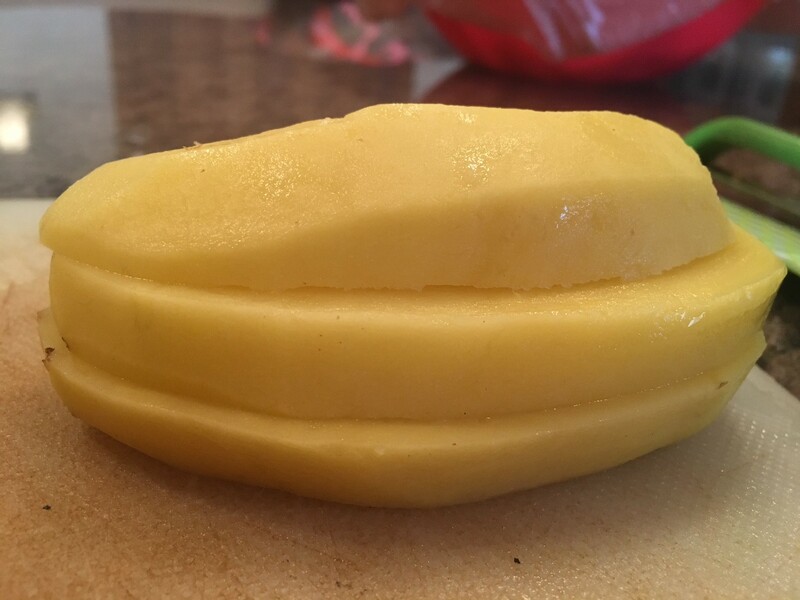 Leaving the root intact allows the layers to remain connected, making dicing easier. For smaller pieces, slice closer together. For larger pieces, make less slices so the strips are thicker. 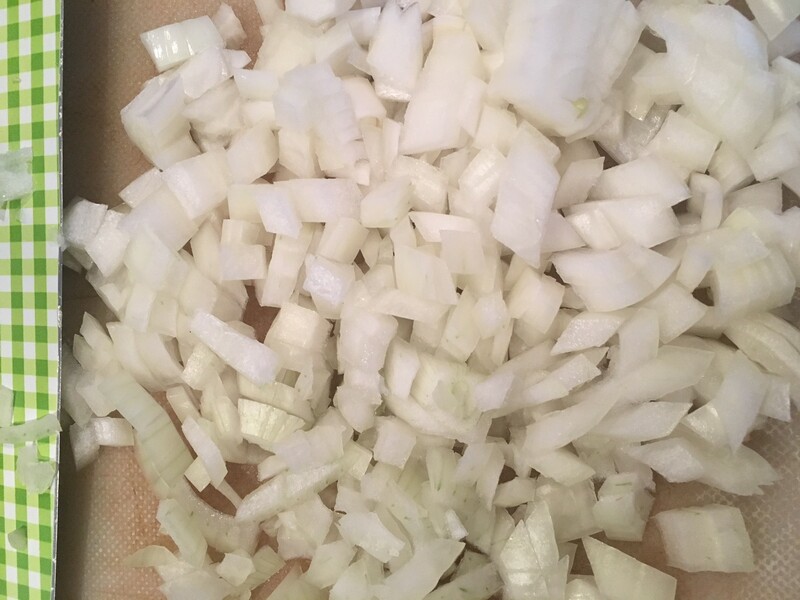 Starting at the front, cut the onion strips width-wise and work your way back until you have beautifully diced pieces. Again, you can adjust the size of the pieces by adding or subtracting cuts. For the garlic, I like to use a handheld garlic press but you can mince the garlic as well. Once your garlic is crushed/minced and the kale is chopped you are ready to finish prepping your delicious soup. Heat large sauté pan over medium heat and brown sausage. Drain and discard the sausage grease. Add sausage and garlic to the bottom of slow cooker. 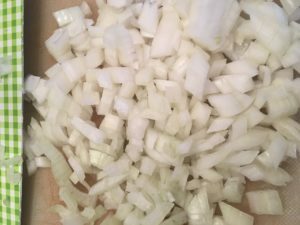 Add the potatoes and onions to the slow cooker. 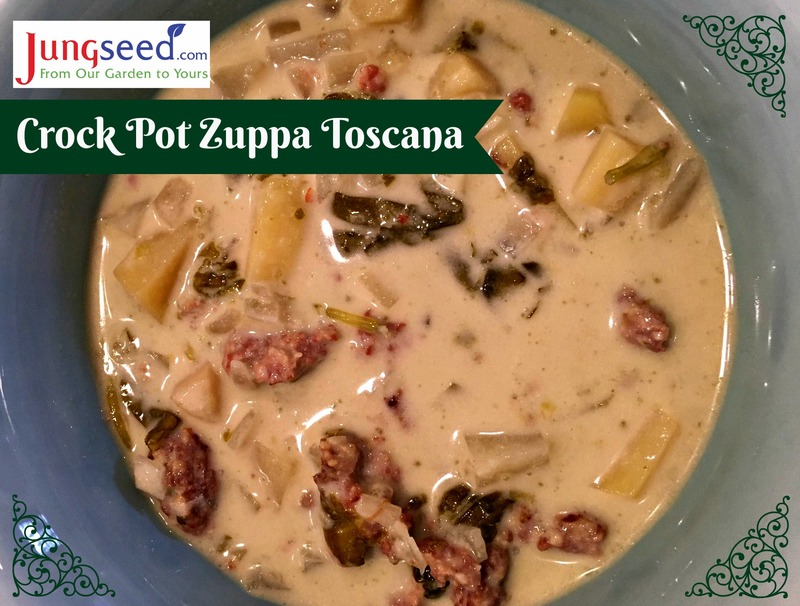 Completely cover the vegetables and sausage with stock. Cover and cook on low for 6 hours or high for 3-4 hours (the potatoes should be soft). Half-way through the cooking process (or at least an hour before serving): Add the chopped kale and heavy cream. Season with salt, pepper and chili flakes to your degree of desired spiciness. 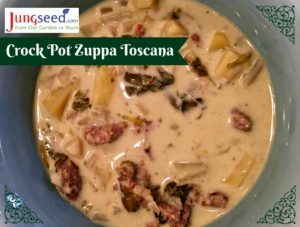 Serve immediately with parmesan cheese as a topping and bread for dipping.